As a school teacher James Maxton was active in the Schoolmasters’ Union, joining the ILP in 1904. A pacifist, he campaigned against Britain's involvement in the first world war and against the introduction of conscription, organized strikes in the shipyards and in 1916 was found guilty of sedition and imprisoned for a year. In 1918 he was elected to the National Council of the Labour Party and stood as a Labour candidate in the 1918 General Election but was defeated. He won the Glasgow Bridgeton seat in the 1922 election, leading to a stormy parliamentary career that lasted until his death in 1946. "I always said he was 'the finest gentleman in the House of Commons'." He was Chairman of the ILP from 1926-31 and again after its break with the Labour Party in 1932, from 1934-39. In this period, he effectively identified the ILP and its militant socialist platform. When he died, the ILP foundered and ceased to be an independent political party. He devoted much of his political life to alleviating poverty within the city of Glasgow. Born 22 June 1885, Pollockshaws, Scotland. 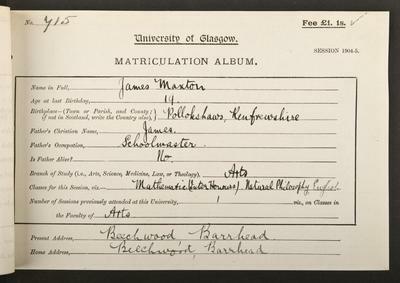 James Maxton was a Glasgow graduate who became a socialist politician, a teacher and conscientious objector. 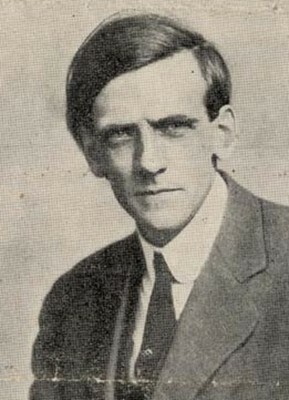 He was prominent among Red Clydeside activists, a member of the Independent Labour Party and the elected MP for Bridgeton from 1922 to his death in 1946. He was a persuasive and powerful speaker, an intelligent and sincere radical voice inside and outside Parliament. Maxton was born in 1885 in Pollockshaws. His father was a schoolteacher and a unionist. He was educated at Grahamston Public School, Barrhead and Hutcheson's Grammar School, to which he won a scholarship when he was twelve. He matriculated at the University of Glasgow in 1903. His education was lengthy, delayed a little by exam failures. He passed English in October 1909 on a tenth attempt and never did obtain a pass in Moral Philosophy. He graduated MA in 1909. He did, however, throw himself into life at university, taking an interest in sport and politics, where he began to question his inherited unionism and to explore socialist texts. He joined the Independent Labour Party (ILP). He entered the teaching profession and like John Maclean, taught evening classes at Pollock Academy. The two men became friends, sharing a passion for radical politics, and later, opposition to the war. Both were imprisoned for a short time after addressing a crowd in Glasgow in 1915. Maxton also resisted conscription, an action that cost him his teaching post. Like Maclean his speeches also fell foul of the law. He was tried for sedition in May 1916 and sentenced to a year in Calton jail. After the war he stood for Parliament, at first unsuccessfully. Records show that he returned to university between 1920 and 1922 to take classes in Political Economy, Forensic Medicine and Public International Law, perhaps with the intention of completing a law degree. In 1922, however, he won Bridgeton for Labour and went to Westminster. He became disillusioned with the party for its lack of support for the miners and in 1931, when the ILP and Labour split he sided with the ILP. He died on 23 July 1946. Middlemass, Robert Keith. 1965. The Clydesiders: A left-wing struggle for political power. London:Hutchinson & Co.
World Changing Project, "Leading the Red Clydeside movement," in University of Glasgow World Changing (University of Glasgow, 2010); http://www.worldchanging.glasgow.ac.uk/article/?id=108 (accessed April 26, 2019). World Changing Project. "Leading the Red Clydeside movement." In University of Glasgow World Changing. University of Glasgow, 2010. http://www.worldchanging.glasgow.ac.uk/article/?id=108 (accessed April 26, 2019). World Changing Project. "Leading the Red Clydeside movement." University of Glasgow World Changing. University of Glasgow, 2010. 26 April 2019 <http://www.worldchanging.glasgow.ac.uk/article/?id=108>.